Automatically folds sizes from 8.5" x 11" and 8.5" x 14", 16-28lb. bond paper, 60gsm to 105gsm. Stapled sets of up to 3 sheets can be folded by manual feeding documents into the feed table bypass. The Martin Yale 1501x Autofolder paper folding machine offer the productivity that you need without becoming overly complicated. In fact, it is a popular choice with Churches, Schools, businesses and associations who are looking for a solid high quality paper folder for a great price. The 1501x is capable of handling both letter and legal sized sheets and is capable of producing four different folds at a speed of 8,000 sheets per hour. You can load up to 200 sheets of paper into the feed hopper press the button and let the 1501 do its magic. The Martin Yale 1501x will even fold sets of 3 sheets through its bypass tray. It offers an incredible set of features for a great value. Check out the Martin Yale 1501x Autofolder today. Operates at a speed of up to 7,500 sheets per hour. Handles sheets sizes starting at 3.5" x 5". Works great for whole sheets not very well for half sheets. You can adjust to make it work but the fold options are limited and come out crooked. Don't waste your money if you want to go smaller then a page. We use this machine to fold bulletins for our weekly church service. What used to take hours by hand is done in minutes and the folds are perfect every time. Transcript: This is the Martin Yale 1501X AtuoFolder Paper Folding Machine! First we’ll begin by fitting the inside folding plate in place by inserting these side grooves into the rubber ends, then push the plate down in place. Do the same thing for the other plate. This time you’ll have a choice of hole to insert to metal spoke depending if you are doing one folds or two. You may need to change this later. This is the Martin Yale 1501X AtuoFolder Paper Folding Machine! Now put on the top plate similarly. Notice where the grooves are and where to insert them into the machine. You’ll have to carefully insert it under these silver screws and over the black bar. Now adjust the edge guides for your paper. Underneath each white dot is an adjusting knob. Unscrew them to move and angle the edges. If your pages are angled here then your folds will also be angled. You can use the small dots to help evenly align the guides as needed. In the end your actually paper are your best guide, at least to start. You’ll also notice that the fold stops on the folding plates can be angled, adding more importance to a properly measured position on both ends. Look for the type of fold you want and reference the column with the correct paper size you are using. Tighten the knobs to hold it in this position. Look for the same image on the other plate and set it as well. Now take the loose catch tray and place it below the metal fuzzy wire. Place the other piece on top of the first at an appropriate distance to hold your folded project. Pushing the on button to the right will run the machine until it is empty. 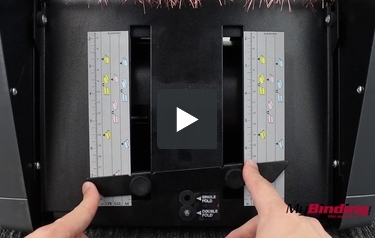 If you stop it in the middle, you’ll undoubtedly get a fold stuck in the machine—so it’s easier to simply load the correct number in place to begin with. It folds very quickly and the stack piles up nicely. Now inspecting the fold I see that I should have run more tests beforehand and made adjustments before running so many at once. To run just one sheet, actually insert it in the middle here. Hold it in place and push the button to the left to run a single sheet through. And lastly, this metal “fuzzy” wire removes any static from you pages so they do not cling to each other when stacked. A wide variety of automatic paper folders are available on the market today. But one to look at a little closer is the Martin Yale 1501x AutoFolder. This machine delivers functionality and productivity without being complicated to operate. Its compact, easy to use design combined with high speed performance make it perfect for churches, schools, and other businesses. Here is a more detailed look at the 1501x AutoFolder. While slightly large to sit on a desk, this AutoFolder is still small enough for table top use. It weighs about 33 pounds, light enough to be moved around easily for shared use. A large feed tray has capacity for 200 sheets of 20lb bond. The folder will automatically feed them into the machine, fold them, and then eject the finished product into the catch tray. A manual bypass allows up to three loose or stapled sheets to be folded together. This is very handy for multi-page invoices, newsletters, and correspondence. This machine is mainly designed to handle letter, A4, and legal size documents. However, the manually adjustable fold plates allow custom folds for paper as small as 3-1/2" x 5" and as large as 8-3/4" x 14". The plates require simple adjustments with a preset guide to help you with the most common sizes and folds. Four fold styles are offered by this machine: "C" fold, "Z" fold, half or single fold, and double parallel or engineering fold. The adjustable plates do allow for a variety of custom folds but require careful and precise modification to ensure straight folds. Paper weights accepted by this device range from 16lb-28lb bond. The motor is rated for output as fast as 7500 sheets per hour. However, it isn't recommended that you routinely use it at this rate. Doing so will quickly wear out your machine. Martin Yale offers a one year limited warranty against defects. This does not include consumable parts, labor, or shipping costs. This machine cannot fold heavier cardstocks, glossy paper, or coated materials. If your office doesn't frequently use these mediums, then this won't be an issue for you. But if these are commonly used for brochures or other documents, you will want to invest in a folder specifically designed with this capability. The plates have to be manually adjusted. For a print shop where things are being moved around often, this may not be an issue. But many offices will find adjusting the plates to be a headache, as it can take much trial and error before getting them in the exact spot for precise folds. By upgrading to the 1701, you can eliminate the hassle and enjoy the simplicity of using electronically adjusted fold plates. For many small to medium offices, the Martin Yale 1501x is an perfect system for quickly folding all their documents. Even with a few downsides, businesses not affected by these will appreciate the speed, capacity, and functionality of this device. The efficiency provided will increase productivity, saving both time and money. Eventually this machine will pay for itself. We think the Martin Yale 1501x is best suited for offices with moderate folding needs who mainly deal with one or two sizes of paper. Do you have covers for your auto-folders to protect them from dust and other elements? Thank you for your question. We reached out to Martin Yale and unfortunately they do not make a dust cover for any of there machines.